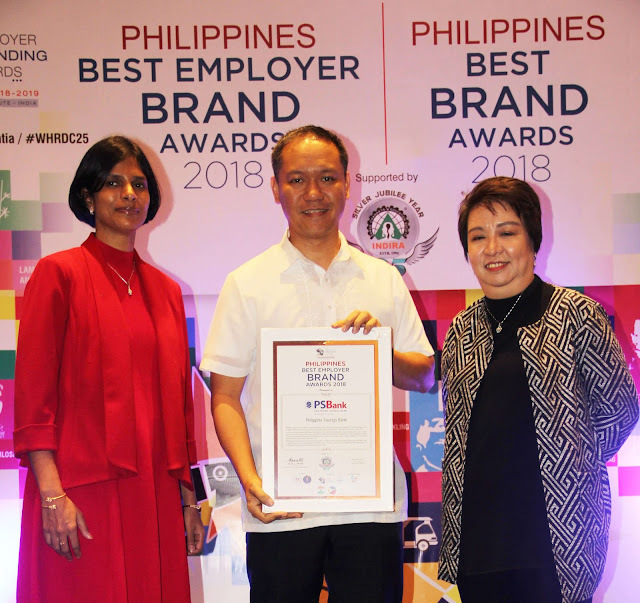 Philippine Savings Bank (PSBank) bagged the Philippines’ Best Employer Award at the 1st Best Employer Brand Awards organized by the Employer Branding Institute, the World HRD Congress and Stars of the Industry Group. PSBank Vice President Mark Lord Limson, Head of Human Resource Group (center) is presented the Best Employer Award at the 1st Best Employer Brand Awards held recently at the Dusit Thani Hotel in Makati City. With him are Divya Sharma, Country Head HR of IBM Philippines (left) and Marie Ampeloquio, Chief People Officer of SPI Global (right). The award, which is the company’s 3rd employer branding award in less than a year, solidifies PSBank’s position as an employer of choice not only in the banking industry but also in the country and even in the Asian region. The Philippines' Best Employer Brand Award recognizes the country’s top organizations that have used marketing communications effectively in attracting talent, developing talent and in retention policy. Key criteria used in selecting winners include translating and combining vision with action, integrated with HR strategy, building line to mesh HR strategy with business and cultivating competencies to enable the organization to be future-ready. “PSBank firmly believes that there is no shortcut to success in building a winning organization, and thus we have carefully developed employee engagement initiatives over the years. The recognition inspires us to further enhance our strategy of delighting our customers by keeping our employees happy and highly engaged,” said PSBank Vice President Mark Lord Limson, Head of Human Resources Group. The recognition is PSBank’s third Best Employer Award in less than a year. The bank was recently recognized as 2018 Global Best Employer Brand at the 26th World HRD Congress held in February this year in India. PSBank was also awarded the Continuous Innovation in HR Strategy at Work award, while Limson was recognized as one of the 100 Top Global HR Minds. Then PSBank President Vicente Cuna, Jr. was the only Filipino to have been conferred the CEO with HR Orientation award. The World HRD Congress recognized the bank’s exemplary initiatives and practices, particularly in simplifying employment processes with the use of automation, strengthening employee engagement with the use of social media, nurturing talents through career development programs and boosting talent acquisition to become top-of-mind employer of choice. In August last year, the bank was also named as Asia’s Best Employer at the 8th Asia’s Best Employer Brand Awards in Singapore. Limson was also recognized as Asia’s Top 50 HR Leaders by CHRO Asia. The Asia’s Best Employer Brand Awards recognizes top organizations within the region that have commendable HR initiatives and uses marketing communications effectively for human resources development.